All these young guns are in their twenties. One is a social entrepreneur working with farmers, another has designed a vehicle for rural areas while yet another visits villages providing solar lamps. One of them turned his house into a school (when he was still a teenager) to educate kids in his village where there was no school. 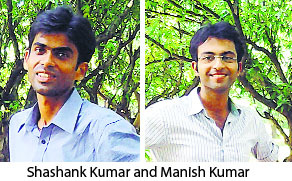 IITians Shashank Kumar (28) and Manish Kumar (30) work in dusty hamlets of Bihar for farmers. They left cushy jobs and turned social entrepreneurs. FarmsnFarmers, their venture, provides end-to-end solutions to Bihar farmers. Their network has increased from 14 to 4,000 since October 2010. Farmers’ income has increased by 25 to 40 per cent. They have degrees B.Tech from IIT Delhi and IIT Kharagpur. Despite a rural background and extensive research; convincing farmers to replicate their agricultural model was tough. Companies or the government provides input like quality seeds or emphasis on organic farming. There were no overall services for farmers. If the farmer buys the new seeds and faces a crop failure, he has to bear the loss. Risks associated with such services made farmers averse to trying newer things. FarmsnFarmers aims to tap the opportunity between vast difference in price paid by consumers and what the farmers get. By reducing the middlemen, FnF saw business opportunity in working with marginal farmers (with 2.5-5 acres of land holding) and also augmenting their income. 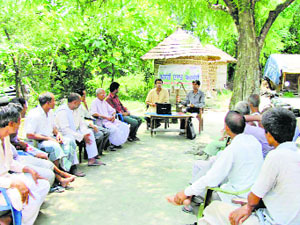 Shashank and Manish with farmers in a village. They provide solutions from the beginning to end. They provide quality seeds, suggest innovative crop cycles for better returns and ensure soil testing. They also give marketing links to sell farm produce at competitive prices. To obviate fear of risks and to gain farmers’ confidence, FnF bear costs of inputs and innovations and take their share when there is profit. In their maiden project in October 2014, farmers in Vaishali district grew rajma alongside wheat and reaped profit. As rajma takes less irrigation, being leguminous adds to sol fertility and fetches better prices in the market; farmers reaped profit. Their model consists of micro-enterprises called DeHaats at block level helmed by a local entrepreneur. There are 12 DeHaats that act as nodal centres for farmers within 10 km radius. The rural utility vehicle designed by Abhinav Das can solve the problems of mobility in rural areas. The innovation can solve problems in rural transportation. His rural enterprise Evomo (meaning evolving mobility) Research & Advancement Pvt Ltd have a production unit in Vatva industrial estate in Ahmedabad. It already has dealers and is set to roll out on roads within a few months. "We will be starting the trial production by December or January and the road price of RUV will be Rs 1.8 lakh," says Abhinav. The price will be Rs 30,000-Rs 40,000 more than jugaad. The socio-economic development of rural India suffers due to lack of effective mode of transportation. Whether it is healthcare, education or urban markets for their agricultural produce, village folks have to suffer. In this vacuum they try ‘jugaads’ that are risky for commuters. Jugaads are locally made motor vehicles made of scrap, old parts of vehicles, wooden planks and even powered by the engine of water pumps thus rendering it unsafe. The Rajasthan Government had banned jugaads in 2000 due to accidents taking place. They are not certified by any authorised agencies. The RUV is in the process of certification from either ARAI (Automotive Research Association of India) or the International Centre for Automotive Technology (ICAT). The basic framework of RUV is made of medium-size strong steel tubes so it is sturdy, lightweight yet economical. It has safety features such that no one hangs out of the vehicle. Banks would provide loans for its purchase. It requires low investment for setting up small plants to manufacture RUV (investment of Rs 40-60 lakh to produce 50 units per month). This could generate local employment. Seeing the potential of RUV, he was given a workshop and office space and seed funding by National Institute of Design (NID) in Ahmedabad. RUV was modified at the National Design Business Incubator (NDBI) of NID. According to Abhinav the RUV has a 600-cc single cylinder engine that powers the vehicle (12 HP and 3,600 RPM. It gives a mileage of 20 km/litre diesel, can carry load up to 2,000 kg, and attain a top speed of 50-60 kmph. 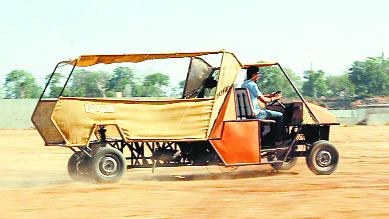 Plans are afoot to attach more parts to it to customise it for multipurpose use by farmers. Devices could be added so that it can be used to drive a water pump, generate electricity, attachment to work as cement mixture or operate small agricultural functions and be of optimum use. Jyotirmoy Chatterji’s project Chirag has brought solar light to villages not on the electricity grid. As a student of HR College of Commerce, Mumbai in 2010, he started an initiative to provide solar lighting to villages in India without access to grid electricity. Project Chirag is one of India’s largest youth-driven solar lighting initiative. It is a registered NGO, the Chirag Rural Development Foundation, to ensure long-term sustainability. "It has provided solar lighting to more than 175 villages impacting more than 35,000 rural Indians. More than 10,000 youngsters have been involved with the initiative and have actively contributed towards creating the large social impact," said Jyotirmoy. More than 6,700 households are getting solar lights. A portable solar lamp unit that has a LED (light emitting diode) device, a solar lantern, a battery, a tubelight and two solar panels, is used. As a social initiative, paraplegics assemble solar lamps and get Rs 30 per lamp. 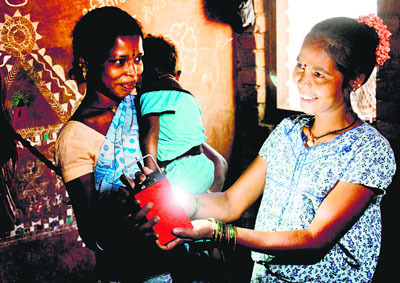 Though the solar lamp cost Rs 3,650, they had to provide it to villagers at Rs 500. The money had to be raised that was done by volunteers and Jyotirmoy learnt how to strategise, plan, execute and mobilise resources from the communities, Government and corporates. This has stood him in good stead as he manages the Chirag Rural Development Foundation. This month solar lighting was given to 500 rural houses in Rajasthan. Babar Ali (22) runs a school Anand Shiksha Niketan from the backyard of his village house. When he was barely nine years old in 2002 , he started the school with 8 students for free for the children of his village. There was no school at Bhabta Uttar Para village in Murshidabad district of West Bengal, Babar Ali took the responsibility on his young shoulders. Lauded as the youngest headmaster in the world by the BBC in October 2009 at the age of 16. He had to convince village folks to send their kids to his school. Earlier the students would bring old cement sacks to sit on floor, now the school has tables and chairs. Babar who had to really convince the large Muslim population in his village to send their girls to school feels proud that today girl students outnumber boys. He was lucky to have gone to a school in a nearby town 10 km away. His father, a jute seller, encouraged his son to attend school. Later Babar did his graduation from Berhampur Krishnath College and is doing his MA English from Kalyani University. Babar’s school is registered with West Bengal Board till Class VIII but is unaided. Though the students study till Class X, they appear for board exams through a high school. "30 students had completed Class X from my school in the last Board exam and the success rate was 90 per cent," said Babar. For higher studies, children studying from Babar’s school are eligible for admission in any state Government-recognised school. Since the inception of the school, 1,000 students have been enrolled. Today there are 300 students in his school from Class 1 to 10. Students from nearby villages trudge 4 km daily to attend school. Teachers are volunteers and the school sustains itself through private donations and help from the local administration. Babar’s sister Amina, now a teacher in his school, was his first student. Following in her footsteps, six other girls who completed their schooling here in colleges in nearby town, teach at the school.